Firstly, a huge thanks for all the comments on the cape. I felt a tad uncomfortable in it, but you were all so nice that I've decided to give the cape another chance and will wear it out and about a bit more. On Thursday evening, I went down to the glamourous and gorgeous Haymarket Hotel to see La Senza launch their SS 2011 swimwear line, and I was really impressed. 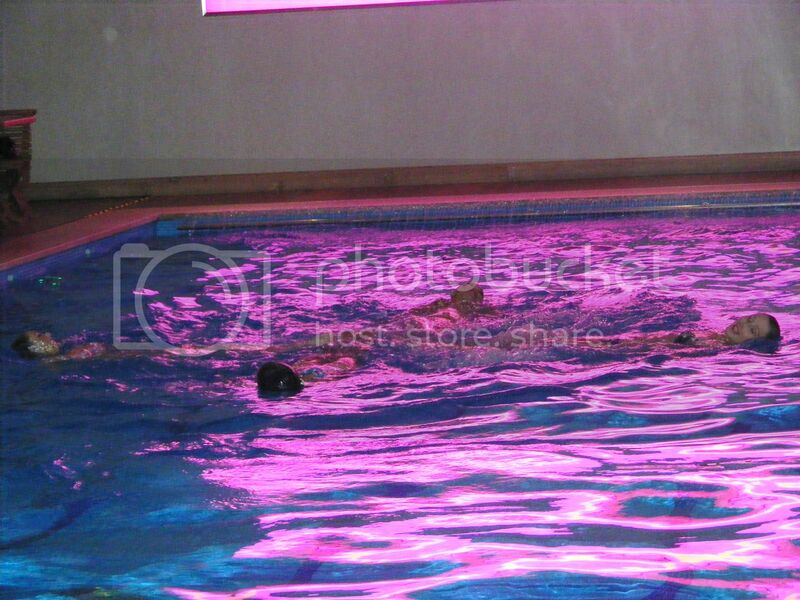 The event was held in the Hotel's swimming pool area and it looked great. There were models walking around the pool, modelling the line, and the different collections were spread around the pool. It was a really fun evening and La Senza have done a great job on the Swimewear line. I also managed to meet the very lovely Vicky, who runs the La Senza Blog. She was amazing to talk to. The collections were gorgeous. I don't want to give to much away about the collection, so all I'm saying is that there will be a lot of stylish women swimming this summer! I'm a huge swimming fan over the summer and I can see myself in so much of the collection. There is an amazing 50's style collection, that gives you a lot of support around the bust, and looks like it fits so beautifully. There are strapless pieces in the collection as well as pieces with Triple Gel, which is a push up bikini. There was a lot of really cool patterns and some great prints on some of the bikini's. Expect a lot of polka dots and even a few nautical ones. Seriously, we are all in for a treat with bikini's this year. To top it all off, La Senza also organised an amazing synchronised swimming routine, featuring The Aquabatix Girls. It was a spectacular show. I've always love synchronised swimming, so seeing it so up close was amazing. The girls were so talented and their make up didn't smudge a bit! Are you all swimming fans? What do you normally wear to the beach/pool? I'm a tankini person, but am really tempted by the La Senza bikini's. Hmm, well I'll be needing lots of new bikinis and swimsuits for my honeymoon in August, so I'll be sure to check La Senza out! I tend to go for the suits that come in bra sizes, as I need the extra support (Sorry, TMI!) but the ones I really like are the triangle bikini tops- sadly can't wear them! Awesome, the synchronised swimming looks great! I have bikins, but I'm kind of tempted by full swimsuits this summer - much sexier! I actually don't really even know how to swim. I love the beach though, but i rarely get in the water. Wow, synchronised swimming always looks so hard, and so impressive! I am a swimmming costume sort of a person - I jsut don't feel comfy getting my belly out. I love 50s-esque full swimming costumes, they're so glam! Love watching synchronised swimming. I'm a tankini and shorts person. wow, what a wonderful show! actually I'm a huge fan of bikinis, I would like to wear more options but I feel like bikinis are much more comfy for me, lov your blog! Interesting place for a show I think. My parents would die if they knew I wear a bikini. Funny thing is too, Andrew like me to wear a bikini, but only if it is just us, if other people, esp family are around he wants me to wear something over it. The synchronized swimming performance would have been neat to watch! I usually just wear a reasonably low-key bikini. This year I've got a cream and black striped one, with ties at the sides of the bottoms. How fun and great pictures. I only go swimming occassionally now but a bit more at the moment since it is summer here. But when I was growing up I was swimming all the time, I was a huge fan of swimming and it's really big here. Oh these pics make me wish for sun and spring even more. Not to mention summer and going to the beach!